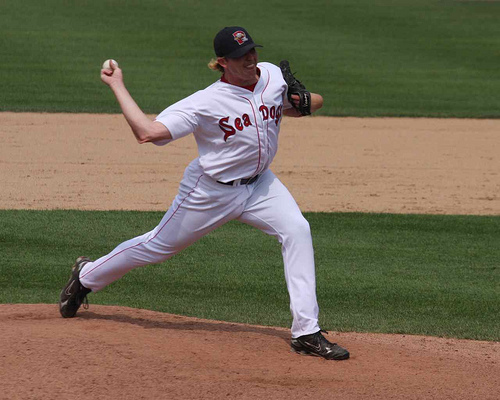 I began throwing sidearm about two weeks into the 2008 season in AA Portland, Maine. It was a move out of necessity to alleviate pain in my shoulder. I had a wonderful mentor in my pitching coach at the time, Mike Cather. The first advantage was the reduction in pain. The second was the increase in movement on all my pitches. The fastball had developed sink to go with its natural run. The slider flattened out, but that seemed to make it even more effective against righties. No, I do not think I would have the same success because I do not believe I would still be physically able to play if I had not dropped down. However, I cannot deny that I've had my best seasons as a side-armer. I think I am definitely more effective from the side. I don't want to make this sound dreary. But to me, dropping down is your next-to-last resort. And knuckleballer is the last resort, in case you were wondering. But it is a case-to-case basis. Health wise, I didn't have much of a choice, in my mind. Another example, a HS senior I was working with a couple years ago was not going to get any playing time. He was the third catcher and a last resort pitcher. He decided he was going to find a way to get on the field and contribute to the team. And he did. He embraced dropping down and found a contributing role out of the bullpen. But If you can be an over-the-top starter, shortstop, center-fielder... ride that as far as you can. When that road ends, drop down. Mechanically, the line from your non-throwing shoulder through your throwing shoulder to your throwing elbow, at the point of release, should not dip below 180 degrees. Dropping down should result from a tilting of the upper body. And on fastballs, feel your hand on top of the ball at the point of release versus on the back or inside. I throw fastball, slider, and change-up. I threw exclusively four-seamers from the side until the last couple seasons. Now, I really depend on a wide 2-seamer as my fastball (rotated back to where the index and middle fingers are covering the horseshoe). Righties, I play a simple game with them. They are going to get pounded down and in with sinkers. And then, they can guess when I am going to throw the frisbee. Lefties, I still pitched them in and tried to back-door sliders and bury change-ups down and away. I use past tense for lefties because this past season I decided to bump back up to a low 3/4 arm slot for lefties. The change-up was much more effective, and the slider became a viable pitch again because it had some depth. A resonating theme I would like to convey is that I pitch in, regardless of arm angle. I've had too many line drives hit back at my head over the years from trying to go away. Guess what pretty much never happens when you go in? That's right, a line drive back at your head. I love seeing a hitter's face when he gets out against me, especially someone I am facing for the first time. I love knowing I just beat him with stuff that wouldn't get me pulled over on the interstate. I'm not stronger, or faster than him. But I just beat him. That's what I love about being a side-armer.